#DidYouKnow: AXYZ has manufactured 6,000 CNC Routers? AXYZ, a leader in global CNC router manufacturing, is proud to announce the sale of its 6,000th machine. The company first started making CNC routers at its Burlington, Ontario facility in October 1994. Currently, AXYZ builds a machine and a half per day or around 380-400 per year. Still going strong after 23 years, AXYZ celebrated this milestone production achievement at its recent AXYZ Router Table 6,000 Event held at the Burlington, Ontario plant on June 21, 2017. 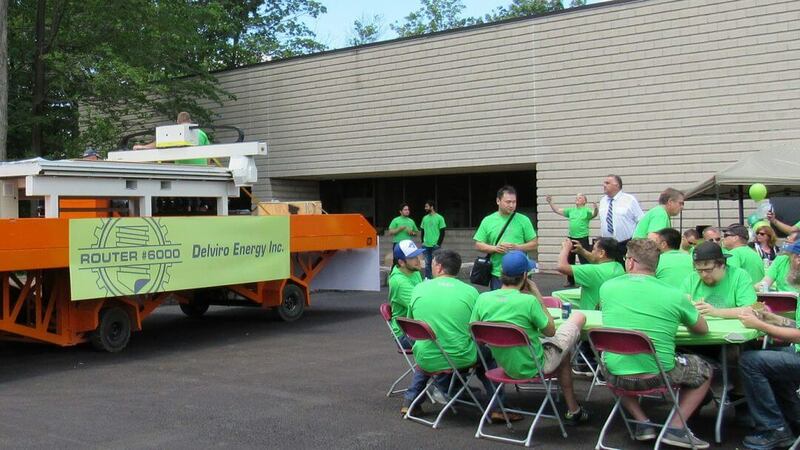 During the event, Delviro Energy, Inc., the customer who purchased the 6,000th table, was acknowledged. In addition, AXYZ employees were recognized and treated to a BBQ. Several community members attended the celebration, including Rick Goldring, the Mayor of Burlington, Mariam Yousefi, representing Honourable Karina Gould, MP, Honourable Eleanor McMahon, MPP and Councillor Paul Sharman from the City of Burlington. Also attending from the Burlington Economic Development Corporation were Frank McKeown, Anita Cassidy and Melissa Gibbins. AXYZ has a unique way of recognizing its 108 employees. “A lot of companies talk about the length of time their staff have worked for the business in terms of how many silver and gold anniversaries there have been or how many 25- and 50-year employees they have,” said Greg Jenkins, Vice President of Sales at AXYZ. “We recognize the longevity of our staff by how many machines were manufactured in the time employees have been with the company.” AXYZ has a celebration for every 1,000th machine produced. This recognition process began when machine number 1,000 was completed. “It’s really a celebration of the business and the staff that work inside our plant. Every business depends on its employees for its success. We recognize our employees because it’s significant, and we value their contributions to the company,” said Jenkins. Whether the employees have been with AXYZ for 50 machines or all 6,000 machines, they all are recognized at AXYZ celebration events. AXYZ have a whole host of CNC router systems, including Pacer, Trident, Optimus, PANELBuilder, Z Series and AXYZ Series.